Digital Signage is an important segment that allows retailers to showcase some attractive advertisements or useful information. 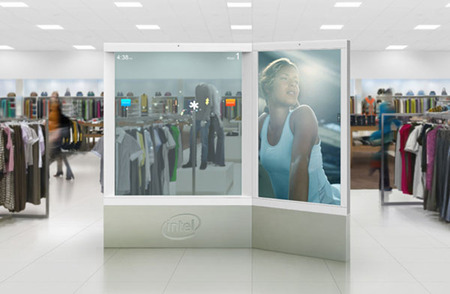 During the NRF (National Retail Federation) convention recently, Intel Inc has demonstrated an interactive ultra-large Intelligent Digital Signage prototype that has able to differentiate from the rest of conventional digital signage systems. Powered by Intel Core i7, the new prototype is equipped with a 7.5-foot holographic based multi-touch LCD display suitable for greater visual experience when being installed in shopping malls, hotels, airports or even outdoors. The prototype is claimed to be able to change the way how consumers interact with digital signage system and with its advanced multi-touch technology and multi-user interface, consumers can easily scroll to the desired menu to find out new promotions, read products review and figure out the respective stores with fully interactive map and direction on each floor, which will definitely enhance consumers’ shopping experience and eventually improve retailers’ revenue as a benefit for all. While you may wonder if the embedded Core i7 processor could be overpower to handle such application, in fact the digital signage system is enhanced with video analytics capability that will able to analyze viewers such as their genders, age groups via its high end camera so that the advertisements can be specifically tailored to attract the right attention at the right time. That is not all, the giant chipmaker has able to streamline the solution with collaboration effort from Microsoft to make it an open standard platform running with Windows Embedded OS with easy scalability and interoperability with new digital signage applications in future. Expected to be available in second quarter of 2010, the system will able to support Intel famous vPro Technology and AMT (Active Management Technology) that allows remote system management and powering down as additional selling points as compared to other conventional systems in today’s market.